Winter snow is beautiful in New Hampshire, however it can be very dangerous, and sometimes frightening for motorists caught in dangerous conditions out on the roadways. A motorist has to be particularly careful, because auto accidents often happen in poor weather situations. Accidents can be minor or can be severe causing you to total your car or cause serious bodily injury. 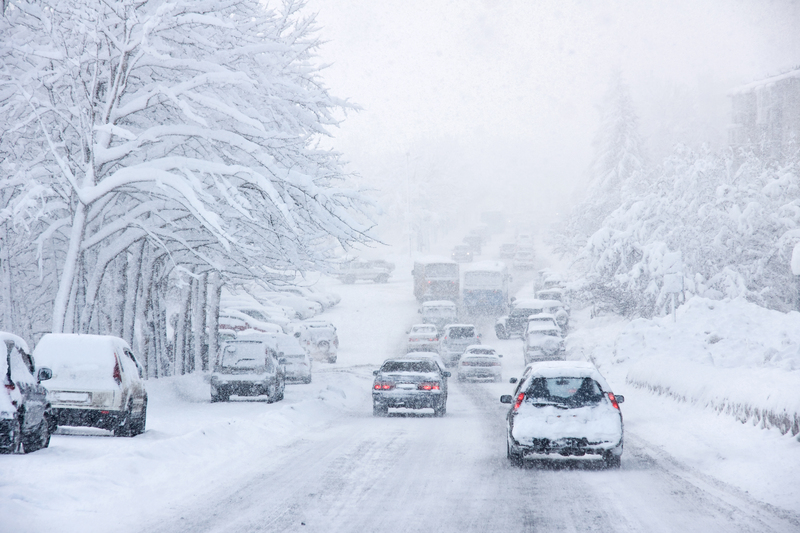 There are all kinds of basic safety rules that help you when you’re faced with a difficult winter road emergency; and tons of information available online. The State of New Hampshire reminds drivers with NH winter weather advisories to limit road travel in times of heavy snow storms to allow the Department of Transportation to plow and treat the roadways. -Avoid driving when you’re particularly fatigued. Make sure you’re getting plenty of rest before and after winter weather tasks so you’re well rested to avoid driving risks. – Never leave your car turned on, or warm up vehicle in an open garage- you risk carbon monoxide poisoning, a serious, silent odorless killer. -Keep your tires fully inflated, but not over-inflated. -Make sure that your gas tank is over half-hull of gasoline to avoid it freezing up. -Try to avoid setting your parking break to avoid it freezing up and causing a problem. -NEVER use cruise control when you’re driving on wet, icy, sandy or snowy surfaces. -Make sure that you’re looking and steering at all times, and you don’t hit the break suddenly or unnecessarily. -Always use your seat belt every time you get in your vehicle. Often, accidents happen close to your house. -Get your car inspected before you go, making sure that everything is operating perfectly by a licensed mechanic- this includes checking the oil, washer fluid levels, the steering and cooling fluids. -Keep your gas tank over a half a tank as much as possible. -Always pack an extra cell phone, cell phone charger, important phone numbers, blankets, gloves and hats, food and water, plus any medication you might need for a few days. -If your car gets stuck, stay with it. Someone will be there to help you, plus your car is your immediate shelter and it’s easy to find if someone comes to rescue you; whereas if you’re walking around in a severe storm is very easy to get lost or lose sight of your vehicle in blowing snow. -If you do get stuck, don’t over exert yourself trying to get your vehicle out, this causes dangerous fatigue and sweat which can cool you down and drain your energy. -Tie something brightly colored to the antenna or at the top of your windows to signal danger or distress, and try to keep the dome light on at night so people would be able to see you, since it only uses a small amount of the overall electricity in your car. It also makes it easier for rescuers to find you. -Never let your tail pipe get clogged with snow, ice or mud. This could leak carbon monoxide into your passenger compartment when your engine is running, or cause the car to backfire. -If your car breaks down, use whatever you can find in your car for insulation; including newspapers, floor mats, paper mats, anything to stay warm. -Accelerate and decelerate slowly, drive slowly, and give yourself about 10 seconds to come to a stop. This means knowing your breaks, and not stopping if you can avoid it. Go slowly, and try to keep your wheels from spinning, getting a little inertia between hills to keep you moving forward. Stay home if you don’t need to drive during a winter snow storm. It’s dangerous on the roads as it is; why put yourself at risk? If you do need to drive remember to drive slowly, be cautious, and get there safe. It’s as easy as that. This information was provided by the accident attorneys at TennAndTenn, New Hampshire’s premier personal injury law firm.